Ma l'anima nel cor si fa pi£ buona. poi che il tonante vortice dispare. Odo altro suono, vedo altro baglore. There are still a lot of Old Towners alive today that remember playing hopscotch, skipping rope, (single and double), making their own scooters with pieces of discarded lumber and two halves of one roller skate, guns out of two pieces of wood and a close pin, strip of rubber cut from old inner tubes. From a garage, we could accumulate some sheets, blankets, window curtains or drapes and anything we could find that would accommodate an audience's rear end would make a theater. Admission was one or two wooden matches. Adults and children alike came to enjoy Old Town's "Summer Playhouse Productions." There are still Old Towners who wake up to the sound of church bells, whether they ring or not, and say their morning prayers. They still cross themselves (their hearts) when they pass a Catholic church, and bow their heads reverently when they mention the name "Jesus." They still kneel in the isle before taking a seat or a pew. The men still do not enter a church without wearing a jacket, if not also a fresh shirt and a tie. The women wear dresses, not mini skirts, cover their heads, and kneel to receive communion. Church bells no longer ring at noon and at six, if they do they are not heard in the din of traffic and the sound of "progress." 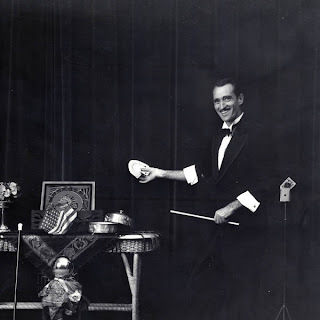 If they do, and if they are heard by Old Towners who were around in the 1930's, either they cross themselves or consciously prevent themselves from doing so, such is the power of religious programming. New Mexicans are not aggressive or competitive by nature. Every book written and every course in American Culture mentions the fact that the Hopi, and the Navajo, had to be taught to compete in their games and races. This writer has also experienced the same behavior in Pueblos. It is less prevalent today than it was back in the 1930's. The worst thing "Mexicans" or Native Americans could be accused of was "thinking of one's self as being 'better' than anyone else," all but the Spanish Blue Bloods and many Newcomers. One local talk show host, with an Italian last name, by the way, to emphasize the superiority of his upbringing in Ohio and those of the locals, ends his petite rampages with, "I guess they were not raised like me." When a Navajo wanted to point out rude or unacceptable behavior he would say; "he/she acts as if he has no kin/family/or relatives. "Mexican" and Italian speakers put down in New Mexico are either; "Que mal educado! or just plain, "Mal Educato!" Still, it's a long way from the 1930's when one didn't race to be better, or win prizes, or play games to win but just for the sheer joy of being part of your group at fun time. As the business district grew, more and more new people came to New Mexico and set up shop, homesteaded. Others simply squatted on private land and on land grants that that was already set aside as legal town sites ear marked to be developed into townships became choice targets. Determining who was, and who was not, a rightful heir to a land grand became the most lucrative practice of law in New Mexico, and it lasted for decades. There were those who began their careers in law and retired wealthy years later, having only worked one case, "The Land Grant Case." Newcomers insisted that because Spain had lost the territory, (to Mexico) Spanish grants were no longer valid and Mexico had lost the war with the United States, the land was free for the taking. Some Texans still believe everything East of the Rio Grande, (in New Mexico ) belongs to Texas, and act as if it did. 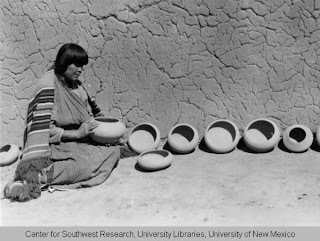 San Ildefonso potter Maria Martinez sitting next to a row of pots. The First American Pageant, Central Ave, Alb., 1928.